As previously posted, I got Mike a Wii for Father's Day and gave it to him early. We all played it last weekend for Memorial Day as we were all gathered for Luke's 1st birthday. I packed it up and brought it home to Katy and just today brought it out to set it up on our big screen here. Got all the bits put right and then no sound. We have a home theater system which makes me think things MUST be harder than they really are. I could get picture but no sound. I checked all the audio inputs in the receiver. I double checked them all. I turned off auxiliary components. Pushed more buttons. Figured I'd screwed up the rest of the system totally but by gum, I was going to figure this out! I finally realized that all I needed was the TV sound - nothing on the receiver - and the TV sound had been turned all the way off. Sigh...simple remedy...involved diagnosis. Find the password (and it was SO SIMPLE I was totally embarrassed - right here in my own living room.) Put in password and click "check connection". It's now 11:02pm and I'm thinking "maybe this isn't as simple as I thought'. Watch little blinking blue squares again with zen-like music smug in my ability to trouble shoot only to be brought back to reality with "Error Code:52130 Unable to connect to the Internet. Please see the Wii Operations Manual or visit support.nintendo.com for assistance." I think I'll just go to bed. This can only end badly if I persevere tonight. Thrown Wiis have voided warranties, I'm pretty sure. So THIS little piggy is going, "Wii, wii, wii" all the way to bed. Luke had his first birthday on Memorial Day - which of course made it VERY memorable for us! :) We all converged on Keller over the weekend having almost everyone present to cheer and celebrate this milestone. GG Ann came with us and Tim, Megan, Kennedy and Lleyton drove down Saturday and spent the weekend as well. I gave Mike his Father's Day gift early - a Wii - so we could all enjoy it over the weekend (which we did). Jennifer had a darling dump truck centerpiece with "dirt" cake and cake "cones" - very clever indeed! Being the good "must lose weight or die" Gramma that I am, I resisted temptation to have any but I hear the "dirt" was fantastic. Jason grilled burgers (with REAL cheddar on them - oh, yum) and there were huge bowls of Texas Caviar and watermelon. It was so satisfying to see all the cousins together, playing, fussing, running, chatting...it is quite exhilarating to have one's "kingdom" all in one place. My spirits were quite dampened on Tuesday when we had to leave to come home. Kennedy spent Saturday night at Jen's house and then Benjamin spent Sunday night at our house. They are entering a whole new dimension of childhood and "cousin-hood". At Sunday lunch, they had the most intense conversation (complete with broad hand gestures) about what had been going on with them that week. I think Tim got a video of it (if so, please share, Uncle Tim!) And all the "next gen" cousins were, at either a year old or ALMOST a year, interacting with each other and playing along side each other. It makes this Gramma's heart quite full to recall the love and affection in those rooms this past weekend. Luke had much fun with his gifts but I think his two favorites were a popcorn popper push toy (you remember those, right? the ones your parents "accidentally-on-purpose" ran over in the driveway?) and a duck push toy. They became his constant "companions" during the party. He is in some ways a very intense little man - you can see the concentration on his face as he tries to figure out what and how to do/say/imitate something. He has a special fascination with "cheek pops" (you know, when you put a finger in your mouth against your cheek, pull it out fast and it makes that "POP!" noise?). He keeps trying to do it himself or even better, stick his lovely, slobbery finger in YOUR mouth and try to get that noise! I can't do it but Papa Mike sure can. Hey, everyone has their claim to fame! Luke is also very vocal - many jibberings and jabberings - and some of them intelligible! He's had "duck" down for awhile. Ba-ba for Benjamin. Da-da and Papa - but I think Gramma is going to take a bit longer to master. However, when I walk into the room, he does break out in this HUGE grin and he holds his little chubby arms up for me to hold him and then snuggles down on my shoulder when I do - oh be still my beating heart! So Happy Birthday Luke. You've definitely wormed your way into our hearts forever. Just like all your cousins have - we are blessed. You are too. I have some of my OWN "favorite things" and, since I don't have a syndicated talk show, dishing with stars and giving away tons of free merchandise to my adoring fans, I'll have to be content with this forum. So, every once in a while, I'll have a "Favorite Things" blurb - wish I could say on a regular, specific day - but that would require organization, thought and time, none of which are my forte these days. So TODAY, Thursday, May 29th, you'll get the first (hopefully not LAST) Favorite Things listing! And with summer upon us, and all the blog entries I've been reading which amount to POOLS OPENING, I bring you (drum roll) TA! DAH! my first favorite thing: a tinted face moisturizer with 30 (yes, count 'em, 30!) SPF! I got a free sample in an order from www.skinstore.com and it was love at first application! It's called EmergenC Sun 30 Tinted Skincare Moisturizer - made in Israel of all places - and I LOVE it! I was really infatuated with Clinque's tinted moisturizer with SPF15 but know it was just a fling now that the REAL thing has come along. And the price is decent as well at $35 for 125ml (4 oz. I believe). And the SkinStore doesn't charge shipping - free shipping on all orders and you can earn rewards towards future purchases. At Mother's Day, they had store wide 20% off - and for a place that sells Prevage (which NEVER goes on sale most places), that's a decent discount when they have it. Also by EmergenC is a product that is great if you get red skin - I get a rosier glow than I'd like on my upper chest as well as chin area. So I got the D-Red Nighttime Strengthening Balm (a bit pricey at $69.50) and it's taking care of the problem. I think the 50ml pot will last a long time - several months in fact - and the redness has really started to fade. Plus it feels so cool and refreshing after application. Another "miracle" product for me is Dr. Brandt's "Pores No More". I use it under my tinted moisturizer (above) as a "primer". Having had oily skin most of my life (which is on the wane as a 51 year old but still there none-the-less), I've always been prone to breakouts and large pores. This product is what I call "pore Spackle", evening out the skin surface so makeup goes on smoothly and flawlessly. It's $45 for 1 oz but lasts several months. It does NOT make me break out and, according to the literature, actually helps PREVENT breakouts! Those are my beauty "nuggets of wisdom" for the day. I don't know about you, but when an item costs more than $40, I want to KNOW it's going to work and that I can RETURN it if it doesn't! The SkinStore allows returns of used products if you are dissatisfied - they do want you to be happy with your purchase. So let's review - free shipping, returns allowed on used products, free samples with each order, no sales tax to Texas and a rewards program - what's not to love?? And no, I'm not getting paid to tout their store or products. I just know a good deal when I see one! I've always said that Tim looks a lot like my Grandpa Crawford. I just came across this photo of him and thought I'd put it up next to one of Tim. Both were in their early 20's when the photos were taken. I'm also going to give Mike his Father's Day gift early - tomorrow sometime. I think he'll be gone on Father's Day anyway (Amsterdam this time) and I thought we'd all enjoy his gift with him. I doubt he'll be reading this blog before tomorrow afternoon so I don't mind spilling the beans that he is getting a Nintendo Wii and several games. Tim has told us several times how much fun they are especially in groups. So what better application that to enjoy it this weekend with all the kids?? I'm on the fence about getting Guitar Hero though so if any of you have experience with that and any insights/recommendations, fire away! Enquiring minds want to know! I had to get Mario Kart. I used to play that when we lived in Trinidad and I was trying to get the boys to wake up and get ready for school. It was in their bedroom so I'd sit there and play that stupid game over and over. They would tease me unmercifully because of my tendency to move the controller in the direction I was wanting to go rather than pushing the buttons. So when the Wii came out, Tim lost no time in letting me know that they finally made a game system that worked the way my brain did (so now I know I am a marketable game franchise - nice to know). Will let you know how it goes and if we end up having to have any physical therapy from playing games. Should be interesting...stay tuned. I have to quit procrastinating and get in there and pack now. I've put it off long enough and Mike will be home in a little over an hour. Will report on Wii reaction - by the kids if husband is less than enthusiastic. I plan to have fun with it anyway. So this little pig will go Wii, Wii, Wii all the way home! 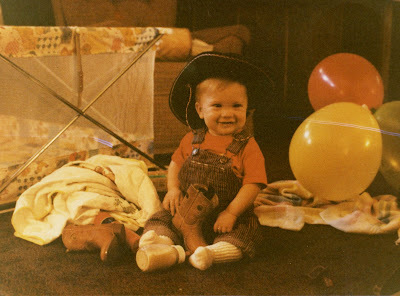 I was looking at Luke's birthday invitation on Jen's blog today and was marveling at how much like his mother he looks. And anyone who knows Jason knows how much Benjamin favors him. Timothy is the spitting image of my Grandpa Crawford. And as I've grown older, I've caught my parent's expressions in my face often as well as mannerisms . 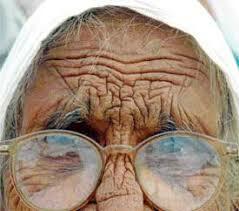 Genetics - the master "Interior Designer" in the natural laws God has put in place. Perhaps I spend too much time looking for resemblances. Or perhaps, being an interior designer myself, I am constantly FINDING resemblances. But it really got me thinking about families - and resemblances in both behaviors as well as physical characteristics. Mike and I've noticed that the longer most folks are married, the more alike they seem to look and act. We've noted that our own children have spouses that could be mistaken for siblings based on looks alone. We have our own theories about this phenomenon one of which is the "sync" happily married couples work towards. And to some extent, we find that, for whatever reason - be it obvious or subconscious - people tend to fall in love with someone who bears a resemblance to themselves. And as time progresses, their behaviors, speech patterns and expressions often become eerily similar. Which brings me to the point of this missive. Often we are known to others because of our resemblance to our siblings and/or parents. What does this say about our lives as children of God? Do we resemble the Father? Are we known by "similar mannerisms"? Can a family connection be made to strangers? By WHOM are we known? And what does this say about how we live our life? And do we resemble our brother, Christ? As we mature as Christians, we should be finding that more and more we are becoming like the Father. This of course can only happen when we spend enough time being instructed by Him. As new Christians, I'm sure many chafe at perceived "restrictions imposed" similarly to a teenager upset with a curfew. But as we mature and know the Father better (by studying His word, spending time with our Christian brethren - our family! - and putting into practice that which we learn about in scripture), we begin to depend on the wisdom of the security of "restrictions", realizing the safety they afford and the peace they bring. We are instructed to come to Him "as little children" - which means we are malleable. We do not come with a list of conditions, negotiating our own salvation. We come empty, ready to be filled. We come ready to receive the love and blessings of the Father. And, the more time spent with Him, the more LIKE Him we will become. So, do others know to whom I belong by any "family resemblance"? And if not, do I realize that, and am I ready to remedy that fact? And Happy Birthday to Jenjer! 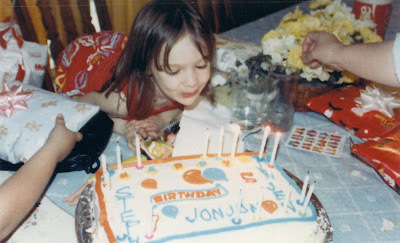 Today is Jenjer's 25th birthday! She is married to Chris and therefore our youngest child. She is mother to Mirai, aunt to Ben, Kennedy, Lleyton and Luke. She worked all through her pregnancy with Mirai and is working full time now - in newly instituted 12 hour shifts no less - while Chris is attending university. Which is NOT easy - especially when said shifts start at 7pm and go through the night. So Happy Birthday, Jenjer! We love you! And here's a pictorial tribute...enjoy! Today is Timothy's 27th birthday. Child number two. Firstborn son. The one enough like me in personality that we alternatively push each other's buttons but also often think alike. He's the one that (okay, Megan, brace yourself..."again??") we went to Disney World to "get". He's also Megan's husband, Kennedy and Lleyton's daddy, uncle to Benjamin, Luke and Mirai. He is the one who can play the "rewrite the song to fit the current situation" song game with me. He could be on "Whose Line is it Anyway?" He and I were the personal commentary on all things television and movies like unto "Mystery Science Theater" - LONG before that show ever came on - which could make it very annoying for everyone else trying to watch said TV or movie. So Happy Birthday, son! We love you! Thanks for the gift - it's GREAT! But then, look at all those darling faces of my grandchildren - what's NOT to love???? Jennifer just posted this on her blog and I'm almost in tears watching it, imagining if it were my grandchildren, in forward facing car seats, in a collision (no, you're NOT going to see photos of crash victims or 'in memoriam' stuff - just watch it). So I'm going to join her on the band wagon to alert everyone to the dangers of PREMATURELY turning those car seats from rear facing to forward facing. It could save a life. When our kids were growing up, I told them that if they ever got a) piercings or b) tattoos that could been seen wearing regular clothing (including shorts or beachwear), they could find their own way to pay for university! Okay, Jennifer was allowed to have her ears pierced - but only one per side. The main reason I instituted this rule (with full backing of their father I might add) was my intention to preserve, for wont of a better term, their "future hire-ability". They were children living in our household and we had rules. This was nothing new to them. And we had seen so many teenagers who obsessed with "body art" and frankly, the thought of a senior citizen with baggy skin with tattoos was more than a little unsettling. But that wasn't the point. The point was this: we felt that until they were adults living on their own (as in "off our payroll"), they did not have the right to make these decision on their own. I don't know if the kids chaffed against our "ruling" or not. It wasn't an issue as far as I know nor do I think they are harboring resentment against us for this "prohibition of self-expression during the formative years". I admit, we are conservative, dare I say (gasp!) Republican? And Mike is in industry - in his career with Amoco and then BP, presentation was very important - to your boss, to your "direct-reports", to companies with whom you wish to do business. Employees represent companies, whether in a positive or negative way. This is "real life". We can debate all day whether or not this is "fair" but the reality is, if you don't have lots of tattoos and body piercings, you're typically going to go farther in a career. I was reminded of this when I was reading a back issue of Reader's Digest, the April 2008 issue. There is an article about how the current trend for folks to "proudly" display photos of their exploits shamelessly on YouTube, Facebook and MySpace. Turns out, lots of employers are combing the internet for information on job interviewees. There were several folks mentioned in the article who thought they had the perfect new hire only to do a search online that turned up unsavory public behavior. Anyone who has access to a television, radio, newspaper or the internet knows about the whole Miley Cyrus thing - and I'm not talking about the Vanity Fair photo shoot either (although that was alarming enough). I'm talking about the photos with her "male friend" and her exposing her green bra. Now, she is backtracking worried that she's "offended her fan base and am so embarrassed" (more likely, she's worried about her bottom line financials.) And she is 15 - a very young teenager! So MY point is this to you parents: I don't care if "everybody is doing it" or anything else, morality is morality. Modesty is modesty. And perhaps the new byline for parents should be "Would you want what you are about to do to be on the internet where it can't be removed for all time for the world to see, saved on hard drives, played over and over again?" I see a lot of parents who have abdicated their God-given responsibility to shape, mold, teach their children how to be responsible adults - either because they want to be "friends" with their kids or they're living out some sick fantasy of what THEY wanted when they were that age. We put plastic protectors in electrical plugs. We cushion the hard corners in our living rooms. We keep doors closed and locked. We tell them to not open the door to strangers. We keep small objects off the floors - we do all these protective measures for our little ones. We want to keep them safe. And somewhere along the way, some parents lose sight of what really makes kids safe - teaching them to make sound decisions about the far reaching consequences of their actions. We are parents, not buddies. They need us to be protective of not only their physical beings, but their spiritual as well. The world needs more parents with "push-back" - say YES when you can but be firm in your NO!s when necessary. Done right, your children will grow up to be adults who know WHO they are, WHOSE they are and WHERE they are going. Yesterday I posted many photos of mothers and children but not any of me with my sons, Chris and Tim. Not on oversight - but a necessity. I will post some of them very soon but yesterday I was going on photos I had already on my computer. I need to go up to the TNTC ("too numerous to count") photo books and pull photos, scan and then post. Back in the "dark ages" when the children were babies, we had this thing called C110 film, a local drugstore to which we took them for processing and brittle, fragile negatives to keep up with if we ever wanted a reprint! Oh, the wonderful advent of digital photography and all it's easy storage! Now, instead of needing more photo albums, we need larger hard drives! So stay tuned - I'll be posting photos of my darling, now adult, sons before too long! Now, if I can just figure out how to get more random access memory (RAM) for MY brain's files! For a very nice tribute from a young husband-soon-to-be-father (son of a dear friend of mine), go to http://newlittlemonsters.blogspot.com/2008/05/mothers-day.html and read it all. I'm proud to say I've known this young man and his family for 17 years, and am blessed by the association. May the toilet not rise up to meet you. May your friends always watch your back. 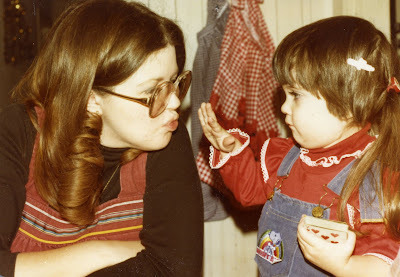 Oh, the top photo is of me kissing Jen's "bo-bo" - it was Christmas, 1980, and I was pregnant with Timothy. 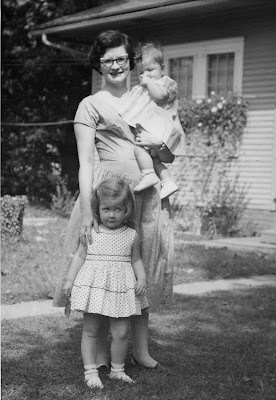 And that's a photo of me (the baby, surprise, surprise), my older sister Kathy (as she was known then - her "pre-Kati" days) and of course, Mom, on the bottom. This is my favorite cheesecake recipe, shared by a friend when we lived in Norway. It is wonderful and can be "lo-carbed" if needed by substituting Splenda for sugar. You will need a 10" springform pan so if you don't have one, buy one - posthaste! Combine and press into the bottoem of the springform pan. When cooked to perfection, turn off the oven and crack the door - but leave the cake IN the oven for another hour or two. Remove cake from oven, cool to room temperature then chill in oven. If not to be served for several hourse, be sure to cover well. To serve, make the sour cream topping and serve with FRESH strawberries - delightful! Mix well and keep in a covered container in the fridge. If you have a larger springform pan (12"), throw another 8 oz container in, ramp up the sugar by another 1/2 cup sugar and add one more egg. As most of you know, we sold the condo we had in Bedford (that we used stateside while we were in the UK) last March as we were building a vacation home in north Fort Worth in a town called Keller. We had it landscaped last July and then proceeded to wonder if between the wet summer that followed and a cold winter, if any of it would come back. Jason takes care of it for us and all I can say is, I WANT LESSONS! He cut things back in the fall, covered them with mulch, remulched this spring, put down pre-emergent on the grass, did fertilizers, etc. When we were up there Easter weekend, things were starting to bud a little but the yards were still 'rice krispy treats' - brown and crispy. I returned a couple of weeks ago following Jen, Ben and Luke's visit to Katy to bring them home. I was FLABBERGASTED by the garden when I saw it! It's GORGEOUS! Jason has done a superb job and loves doing this - he just finished doing his front yard and had completed his back yard last summer to fall. I can kill a silk plant so am in awe of anyone who a) doesn't kill things, b) knows how to "winter" plants and c) enjoys doing it! He told me the back lawn was helped by Shelby and Izzie, ahem, "helping with fertilization" - it looks like a putting green! Lleyton's Birthday Party - Extra, Extra! Read all about it!! I finally got the album of photos from Lleyton's first birthday party celebration up (click to view). It was a wonderful weekend and I've relived it over and over looking at photographs. I loved the way all the cousins played together, especially the "new kids on the block" (Lleyton, Luke and Mirai). Tim made fantastic fajitas using Becky's recipe (yeah, thanks Becky - they are the BEST!) and I'm anxious to try the recipe myself. Lleyton got his first cake and stuffed in his mouth very, uh, "ceremoniously". And of course, he really liked it! Megan's parents (MoMo and Mac) came from George West along with her two sisters, Marib and Hannah. Wes had a school activity so was unable to come (missed you Wesley!) Nana was there too (Crickett's mom). My mom was there (GG Ann the kids call her) as well as Mike's folks (Papaw Pete and Mamaw Peggy). Jennifer, Jason, Ben and Luke were down from the DFW area as were Chris, Jenjer and Mirai. So Lleyton was surrounded by many of the people who love him best and to mark his first year. We love you, Lleyton! Last Saturday, the entire family gathered in Pflugerville to celebrate Lleyton's first birthday. It was a Paparazzi fest! I had my new camera, Chris had his professional camera there, Jen had HER camera, video cameras were rolling - it was the first time we had all been together in one place, including the great-grandparents, since the last three grandchildren were born last year! I will post an album of my photos later on in the week but for now, here is a montage done by Chris that he posted on his blog today. Enjoy!